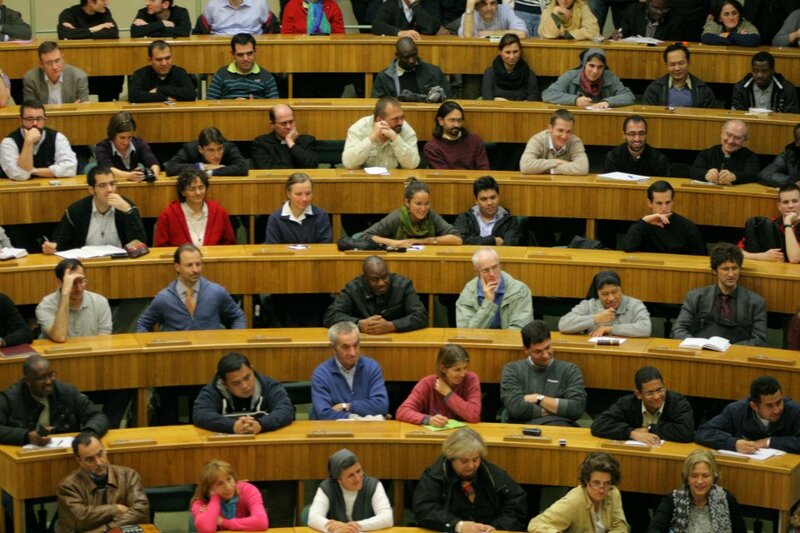 Jean Vanier, founder of L’Arche, spoke to a crowded aula magna at the Pontifical Gregorian University in mid-November . Advertised on the university homepage only three days in advance, perhaps it is not a surprise that the organizers at the Greg initially put us into a smaller aula across the hall. And arriving twenty minutes early, it seemed they might be right – there were so few people in the aula we felt we had time to get coffee. At just five minutes to starting time, however, the place was packed to overflowing, and we were moved to the largest room at the Jesuit university, and still had standing room only, when the towering 84-year old arrived a few minutes later. L’Arche is one of the “new movements” in the Church that is particularly characteristic of the Italian and Latin American churches, but originated with Vanier in French Canada. A philosopher and author of at least 30 books, he co-founded L’Arche in 1964, which is now present in 40 countries and 150 different communities. Few people could have earned such a response from the Roman university crowd: An ovation on arrival, rapt attention, and a room-busting crowd on short notice and minimal advertising. By A.J. Boyd in La vita Roma on November 16, 2012 .